Marc Benioff is still the visionary behind Salesforce. Long-time favorite Salesforce.com (CRM - Get Report) reports tonight, and expect a strong report. The industry is looking for EPS of $0.47 on revenue of $3.23 billion. These numbers would be good enough for year-over-year growth of 42%, and 26%, respectively. 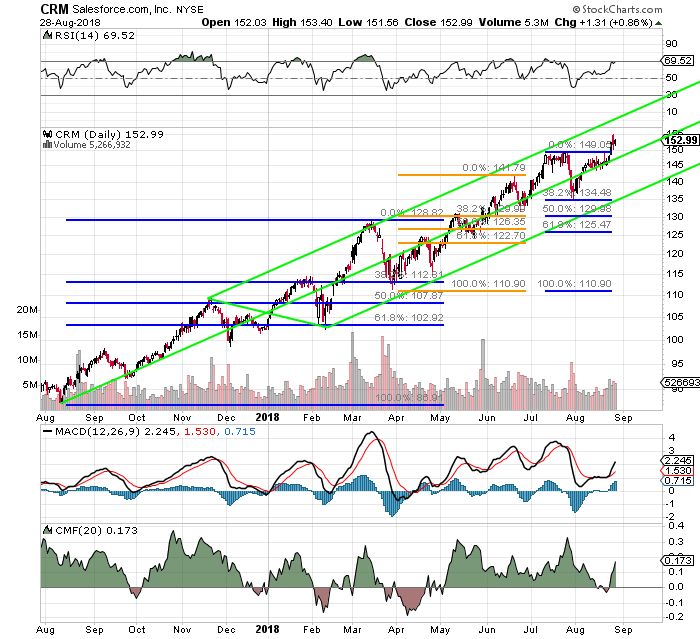 You may recall that back on July 11, I raised my target price for CRM from $145 to $152. The last sale that morning was $142.45. The stock was unfairly punished as trade-related headlines made waves. Twenty days later, on July 31, with the last sale at that point down to $138.03, I again increased my target price from $152 to $160. May the Salesforce Be With You. I think that Salesforce is an easy name to like. Seems highly valued? Sure, 56 times forward price-to-earnings multiple is expensive. The whole cloud space is expensive, because that is where the growth is in 2018. Margins are rising, cash flows are solid. Debt is manageable. How much of the valuation was priced into having a well known, well liked, obviously competent CEO like Marc Benioff at the helm. Well, we have not lost Benioff. He is still the visionary and the marketing guy. Nearly a month ago, the firm promoted COO Keith Block to the position of co-CEO. Block is going to run operations and execution. Can this work? I think it already might be. I also think that this is an example that maybe a firm such as Tesla (TSLA - Get Report) should probably follow -- for very different reasons. Sell (write) one 144 Sept 28 put option (last: $2.58). Note that there was no volume for this product yesterday, and the bid went out at $1.94, so the valuation is volatile and any participation will impact price discovery. Buy 100 shares at $144 or better on a weak reaction to earnings (which is possible, given the recent run). If hit on such a bid, my immediate reaction would, in my opinion, be to sell (write) a Sept 28 call option with a strike price of a roughly $8 premium to the equity purchase price. This should, in theory, pay the investor $2 to $2.50. If that premium is not there in the morning, the trade then becomes less worth it, and I figure something else out.